Saturday, April 12th 10:00AM to 5PM (with a 1 hour lunch break). 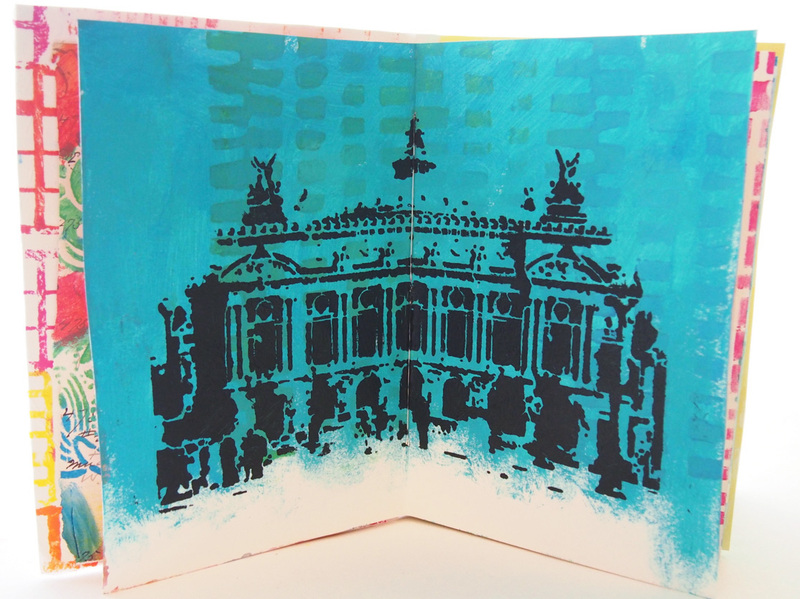 Stencils are a tremendous creative tool that are versatile and playful at the same time! 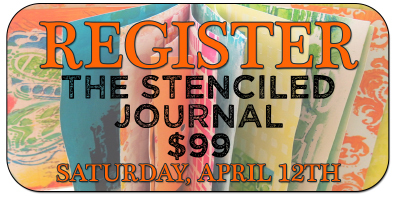 I’ll be sharing the “rules” about stenciling and then how I break them during this workshop! The journey of your journal will begin as a stack of various papers including my 100+ year old ledger paper and favorite dictionary papers. 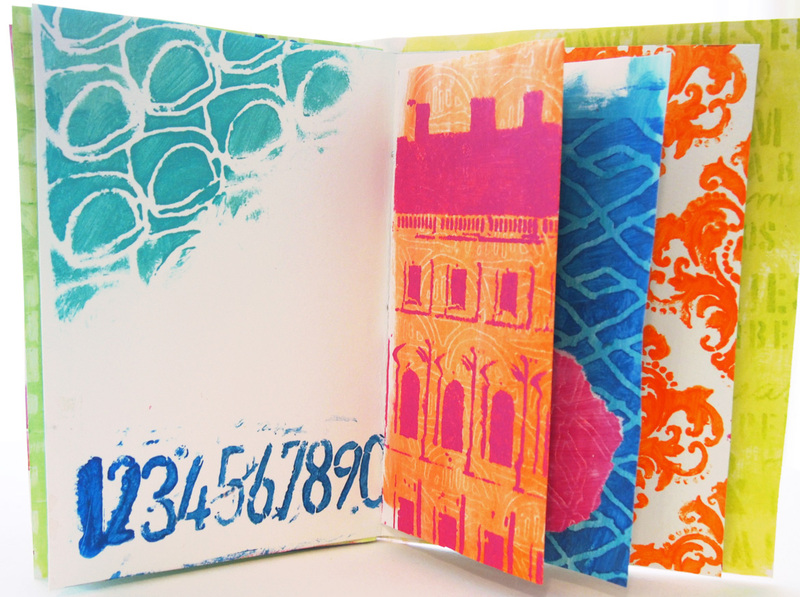 As we build the patterns and colors on the pages you’ll learn my top 10 techniques for stenciling. In addition to the techniques, I will share with you my tips and tricks for keeping colors from getting muddy, how to get very different looks from one stencil, how to make a stencil look your own, how to use every drop of paint on a stencil, and how to handle an oops or two. These papers will be sewn into a journal, the quick and easy way. No measuring. No complex stitching. A quick and simple way to bind your papers into a journal. Then it is time to use stencils as focal images. I’ll share with you the hows, the whens, and the whys as we add the big images to the pages in our journals. She has an addiction that doctors have said is incurable. An addiction to color and art supplies. Symptoms include blue and green spray ink stain on the cuticles, splatters of paint on every article of clothing no matter how hard she tries to avoid it, the compulsive need to cover up all white space with art supplies, uncontrollable excitement when new products are released, and a fever for things that sparkle. Carolyn spent 10 years trapped in the body of an elementary school teacher before realizing her true place in the universe was as a mixed media artist. 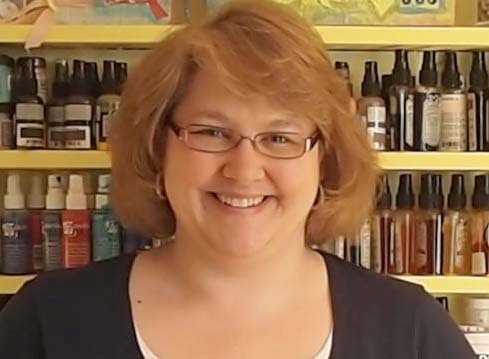 It is no surprise that she has a talent for tutorials and step-by-step blog posts. She shares practical real world “I can do this” type of tutorials designed to thwart those pesky inner critics. 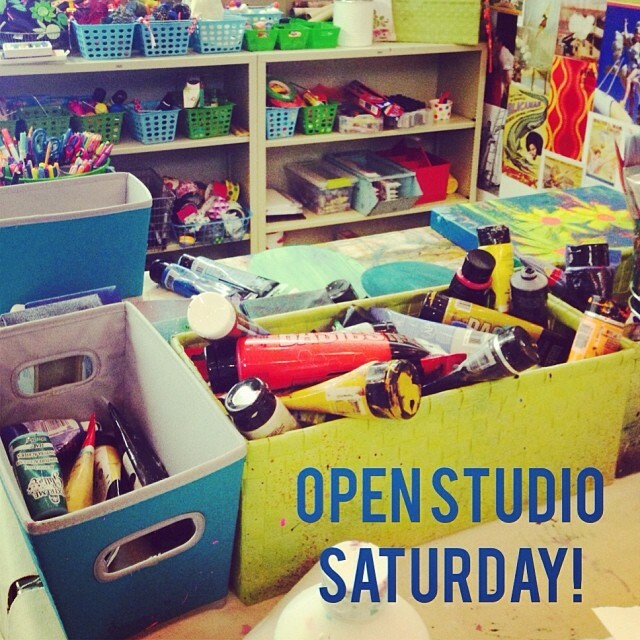 Open Studio this Saturday, January 18th from 10 AM to 5 PM! If you come down to take a tour, I’ll give you a free little mini-art journaling lesson and talk to you about what it is. If you want to play it’s only $5 an hour or $20 for the whole time! Stop thinking about coming to play and just come play *grin*! Hope to see you there! We’ve got two really fun studio days planned coming up this month! I am so dang excited to announce a spring workshop as big as my annual October workshops! These are PACKED full of goodies, techniques and friendship! I hope to see you there. Full balance must be paid by March 1st via Paypal to tangiebaxter@yahoo.com. 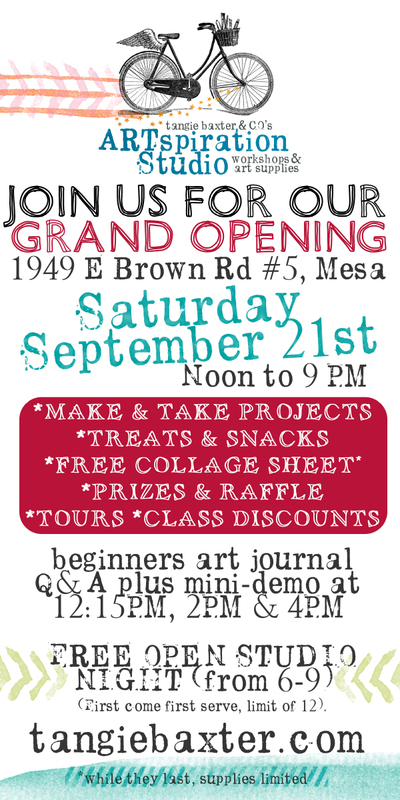 This workshop will now be held at the NEW STUDIO! These are nicer hotels, if you want something more inexpensive, the zip code is 85203 if you want to search for others. I’m SO THRILLED to let you know that I’m now able to offer an early bird registration gift! I had to be sure it was going to work with my schedule and I’m so exited to announce the plans today. Not only am I offering a new registration option if you register by December 1st (I heard those emails , you wanted a way to give this workshop for Christmas with the balance due AFTER) but I’m going one step further and also including a meet the artist Q&A LUNCH, the best part is…it will be MY treat! A free lunch where you can ask me anything you want about how I started my business, how I plan workshops and retreats, how to get started in your own business, share Disney memories and just about anything else you could want to ask! Both of these offers end December 1st, 2013 at 11:59 Eastern, don’t miss out! Art journaling is combining art and record keeping, often referred to as “visual journaling” it’s an incredible way to document your life, thoughts, feelings and dreams. 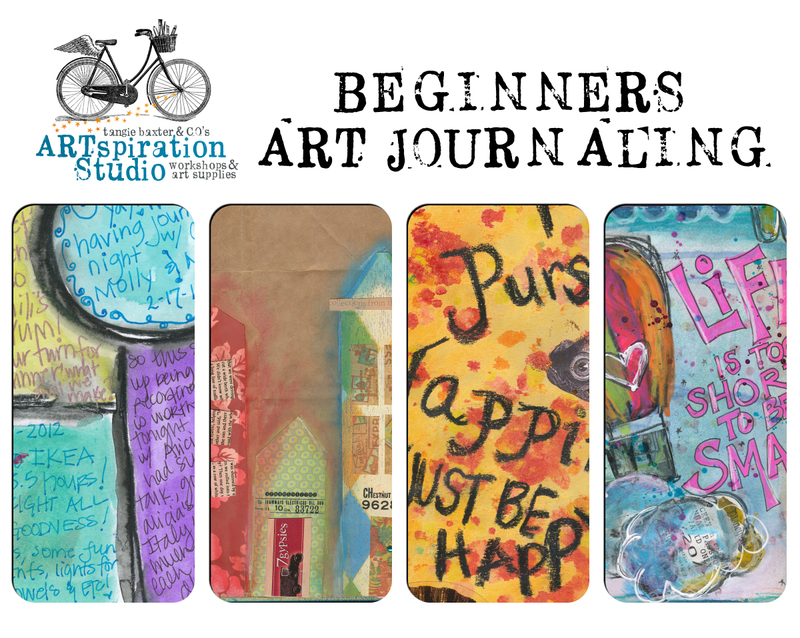 Come learn the basics about “art journaling” and the many different types of styles and ways to do it. 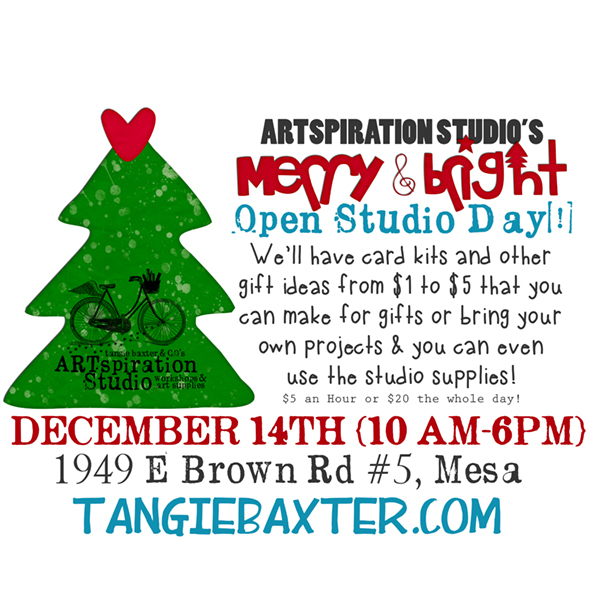 You will also get a tour of the studio and a thorough explanation of all the different mediums (paints, inks, stamps, sprays, collage fodder etc) and how to use them not only in art journaling but in other craft projects as well. 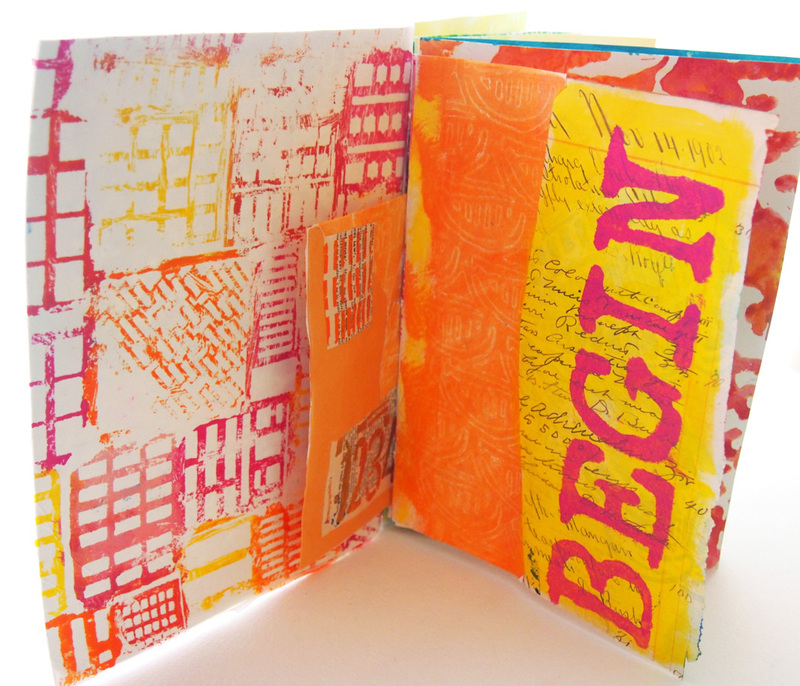 Class includes a Collage sheet, very basic six page 4×6 starter journal, use of the studio supplies and instruction. We’ll be creating a frightfully fabulous (but not scary!) Halloween themed journal! 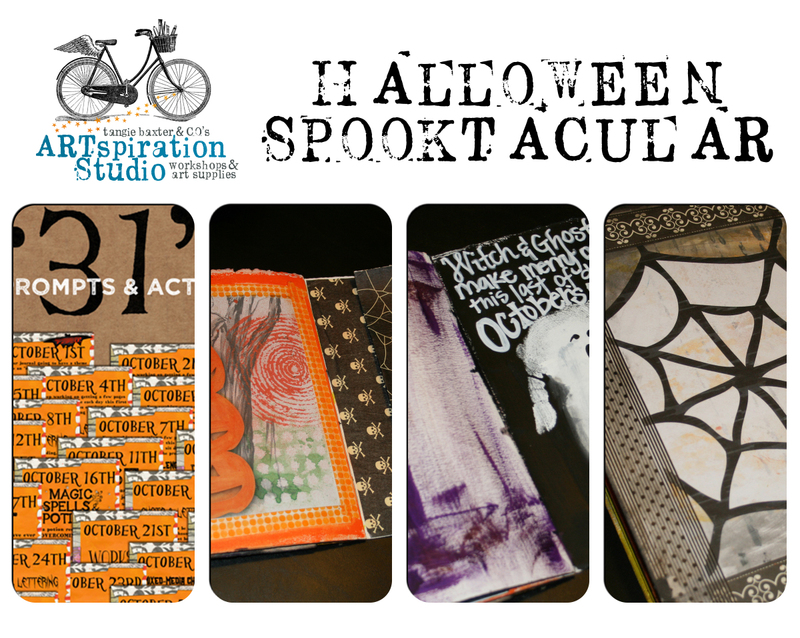 We will prepare all the foundations for an awesome October journal just ready for you to fill it up during October! It will be a great journal to record all your October happenings, paste in a few pictures and write down your thoughts about fall. Or if you are an advanced art journaling fanatic this is a great journal for the theme “Facing My Fears”. Workshop includes “writing and art” prompts to take home for every day in October, collage sheets, Fabriano journal and instructor based demos throughout the evening. (Don’t be surprised if you see some spooktacular treats to goblin, I mean gobble down too!). Pricing including kit & all supplies $75.00 ($55 class fee, $20 kit fee). Were you one of our amazing Kickstarter supporters? You are also invited to a private party the night before! Level: ALL (You may need to take an introductory class if you aren’t comfortable working without instruction yet). 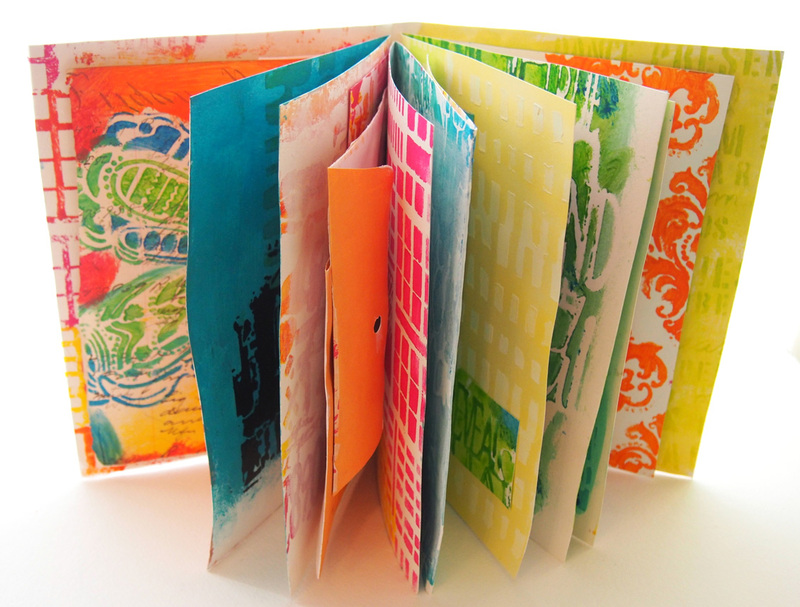 Open Studio Time is a wonderful way to work in your art journals (or other projects) at your own pace in an environment specifically designed for art journalers ! 1. Use of basic art journal supplies such as paints, brushes, stencils, ink sprays, basic pens, scissors, collage fodder, and assorted other art supplies that will change/vary each time. 2. A place designed to do ART! Huge art sinks to wash out your brushes and stencils, large paint counter to spread out your work, large tables to work at! You don’t have to worry about “spilling” a place designed for art by an artist! 3. Fabulously creative environment, with the energy of other creative people around you. 4. No distractions that journaling in other public places has like kids, waiters and the heat/cold! All of this for only $5 an hour or stay all day* for just $20. *Hours will vary. 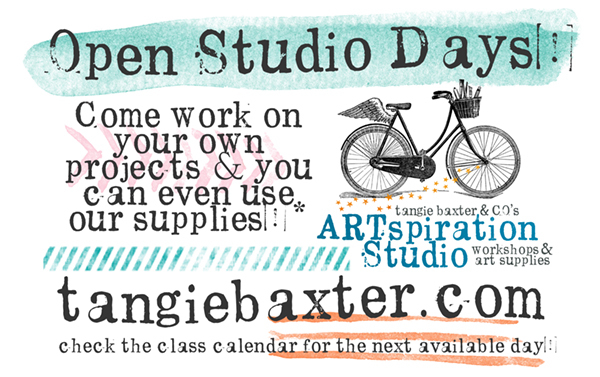 Open Studio supplies are limited to light/regular use, if you have a big project please ask for details on pricing. We ask that you be courteous to all artists present by keeping your language and conversations appropriate for all ages and sensibilities, thank you! We suggest bringing your own favorite pens if you have some and your own glue. 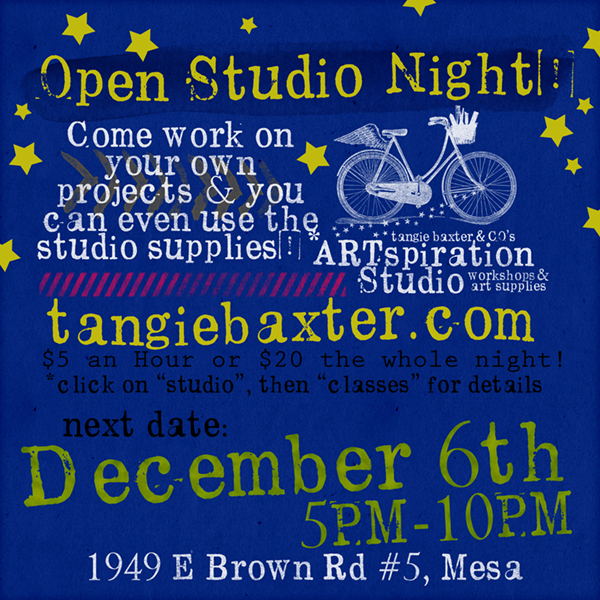 Open Studio Time is on a first-come first-serve basis. 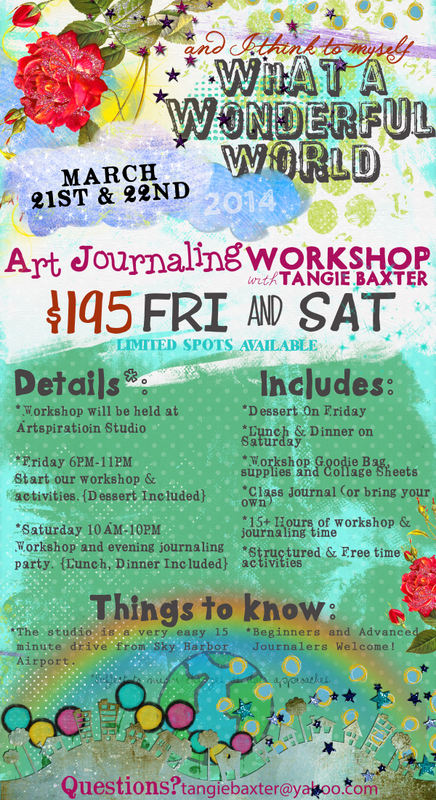 I’m so thrilled to tell you about the first “weekend” workshops that will be held at Artspiration Studio! 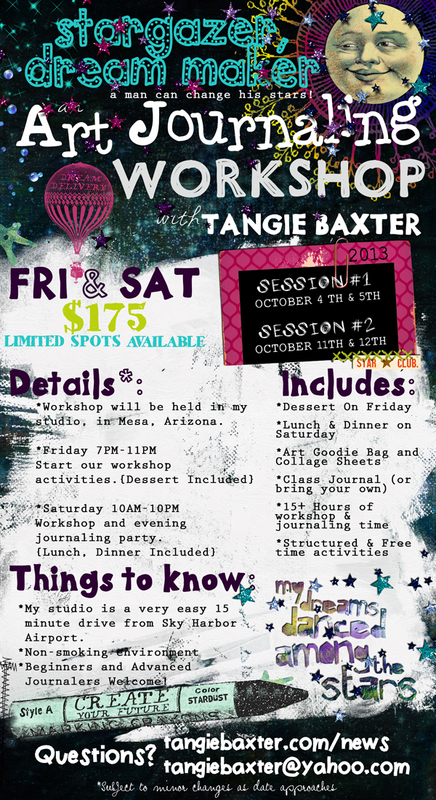 The Dream Maker Workshop will be an epic event! 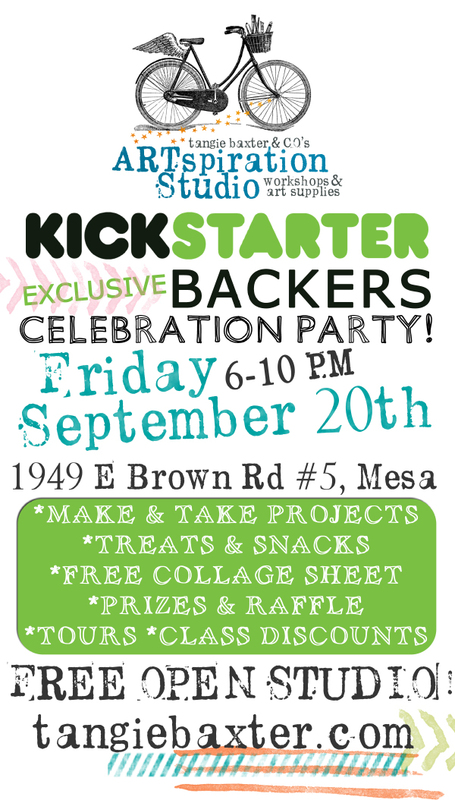 Seats are extremely limited and this introductory celebration pricing won’t apply to future workshops. 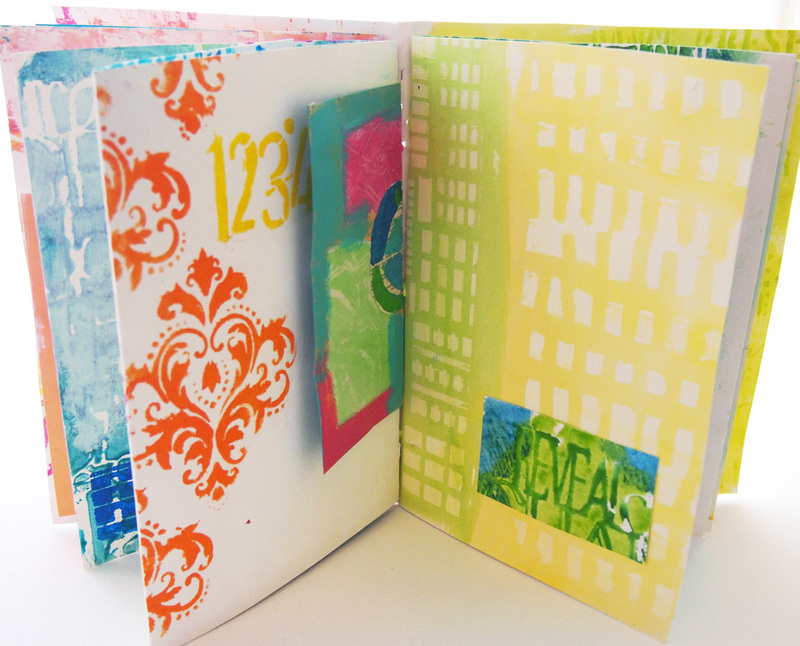 Weekend workshops are “themed” and we make/finish an art journal in two days! The October 2013 theme is “Dream Maker” a sparkly, star dusted journal to record your dreams of all kinds! If you are member of the Art Journal Caravan there is a place for you to coordinate sharing of rental car/hotel etc. These are nicer hotels, if you want something cheaper, my zip code is 85203 if you want to search for others. (There are some really gross hotels, so if you find one you would rather try email me and I’ll let you know if I know anything about it). June Art Camp for Kids!